In 2009, 50th year since the foundation of the Company, Marcegaglia and La Triennale di Milano presented Steellife, the first international art exhibition dedicated to steel: the passion for steel and the ability to transform it are Marcegaglia’s signature style, here exposed with high cultural and aesthetic relevance. Compila i campi qui sotto e riceverai il PDF direttamente sulla tua casella di posta. Please fill the form below in order to receive the PDF directly on your email. and I authorize the use of my personal data. Autorizzo al trattamento dei miei dati personali qui indicati per l’invio di vostre comunicazionipromozionali e/o commerciali ai sensi del Regolamento UE 2016/679 (“GDPR”). I hereby authorize the use of my personal data for sending commercial or promotional information according to Regulation EU 2016/679 (General Data Protection Regulation). The Marcegaglia Carbon Steel plant in Boltiere (Bergamo) is dedicated to the manufacturing of welded cold-drawn precision tubes for automotive, hydraulic and mechanical applications. The Marcegaglia Carbon Steel plant in Casalmaggiore is specialized in the processing of carbon steel hot rolled strip for the production of welded tubes and hollow sections, round, square, rectangular and of special shapes. The Marcegaglia plant in Contino (Mantova) is dedicated to the production of carbon and stainless steel cold-drawn bars. The Forlimpopoli plant is specialized in the processing of stainless steel tubes for applications including automotive, process and decoration, and of carbon steel tubes for the refrigeration industry. 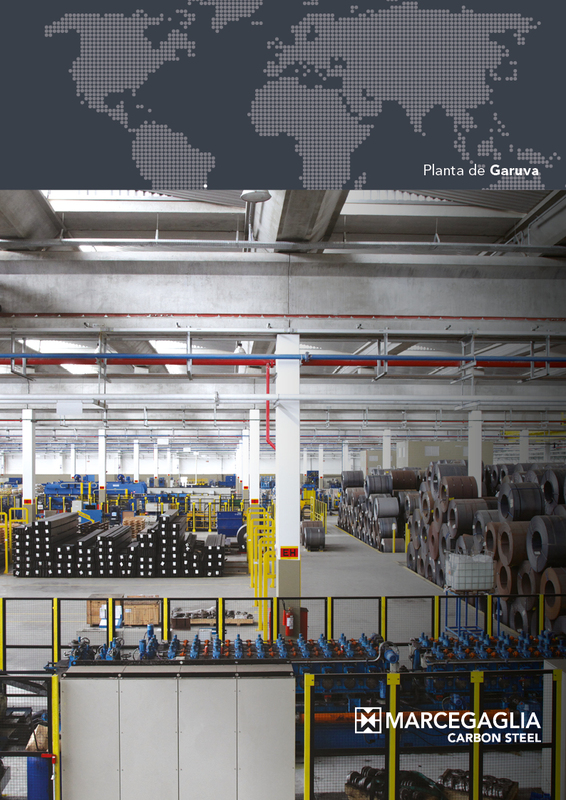 The Gazoldo degli Ippoliti plant hosts manufacturing lines for the production of carbon & stainless steel coils, strips, sheets, flat bars, carbon steel welded structural and precision tubes, as well as Marcegaglia Headquarters. ETA division is specialized in the sales of carbon steel tubes & hollow sections. Several types of threading are also performed for the production of micropiles, for applications such as foundation, consolidation and ground stabilization. The Marcegaglia plant in Lomagna (Lecco) is dedicated to the manufacturing of high-frequency welded tubes from hot-rolled pickled strip, cold-rolled strip and coated. Marcegaglia Ravenna is the group’s main processing and logistic hub for carbon steel coils. It hosts facilities for the pickling, cold rolling, annealing-skinpassing, hot dip galvanizing and pre-painting of steel flat materials and a service center. The Marcegaglia plant in San Giorgio di Nogaro (Udine) is dedicated to the manufacturing of heavy plates (quarto plates) for applications in the building & infrastructure sector, pressure vessels and other specialized uses. Trisider, a Marcegaglia Carbon Steel division, is leader in carbon and stainless steel distribution in north-eastern Italy. Its headquarters is in Tezze sul Brenta (Vicenza). Located in Garuva, State of Santa Catarina, Marcegaglia do Brasil plant processes carbon & stainless steel tubes and flats and components for the refrigeration industry. Marcegaglia China plant is located in the Guangling Economic Development Zone, Yangzhou (270 km from Shanghai) and is mainly devoted to structural tubes, cold-drawn tubes and automotive tubes. The Marcegaglia manufacturing facility in Kluczbork, Poland is dedicated to the production of carbon steel welded precision tubes, strips and sheets for a wide range of applications. The Russian plant located in Vladimir (180 km East of Moscow) is specialized in the manufacturing of stainless steel tubes and sheets. The Marcegaglia UK production facility is located in Dudley (West Midlands). Established in 1996, it is devoted to the manufacturing of ERW tubes for a wide range of applications. The Marcegaglia USA production facility, located just outside Pittsburgh, PA, is devoted to the manufacturing of stainless steel, duplex and high nickel alloy pipe and tubing, as well as galvanized tubular products. Pickled, cold-rolled, hot dip galvanized coils product range and technical specifications. Pickled & single-pass, cold-rolled, hot dip galvanized strips product range and technical specifications. Black, pickled, cold-rolled, hot dip galvanized sheets product range and technical specifications. Pre-painted coils, strips & sheets product range and technical specifications. Product range and technical specifications of carbon steel welded tubes for applications including structural, precision, pressure purposes. Product range and technical specifications of cold-drawn tubes for applications including hydraulic and automotive industry. Global product range of carbon & stainless steel round, shaped and flat bars. Global product range of stainless steel hot rolled & cold rolled coils and sheets. Marcegaglia global product range of stainless steel tubes & pipes. Stainless steel range of bright bars, flat bars and cold formed sections. Collects Marcegaglia global product range of heavy plates (quarto plates). Collects Marcegaglia global product range of heavy plates (quarto plates) for structural applications. Collects Marcegaglia global product range of heavy plates (quarto plates) for pressure vessels. Collects Marcegaglia global product range of heavy plates (quarto plates) for steels for quenching and tempering & case hardening steels. From Marcegaglia steel transformation business, a full range of products dedicated to the refrigeration and household appliances industries. Metal handles and accessories for house cleaning, painting and DIY. Detailed product range of insulating panels and corrugated sheets for wall and roofing applications. Detailed product range of Marcegaglia panels for industrial and residential sectional doors. Detailed product range of steel road safety barriers for roadside, bridge side and central reserve installation. Technical data about Marcegaglia Buildtech guardrail range: certifications, crash tests and technical specifications. Detailed product range of steel single sided safety barriers. Detailed product range of central reserve safety barriers. Detailed product range of safety barriers for bridge. Detailed product range of integrates noise protection and safety barriers. Detailed product range of special components, standard end terminal, standard connection and protection panels. Marcegaglia’s detailed product range of steel scaffolding and shoring systems for civil and industrial building sites. Marcegaglia steel construction solutions for the shipbuilding industry. Installation manual for the Realpont prefabricated frames scaffolding system. Installation manual for the SM8 multi-directional scaffolding system. Research and development in the energy production sector, including power generation from renewable sources. Power generation from renewable sources. Renewable energy integrated generation system. Advanced composite materials, electronic and electro-mechanical components. High technology armors, radomes, polarizers, covers and other components for boat construction, automotive and aeronautics.